IHBC NewsBlogs since the 2018 Annual School in Belfast have offered occasional recaps on sessions and reflections on learning and development opportunities around the School theme of ‘Our Shared Heritage’, while now the Social Media lead for the IHBC at the School, Alison McCandlish of Crenellated Arts – an IHBC HEPSR recognised business – outlines the outcomes. 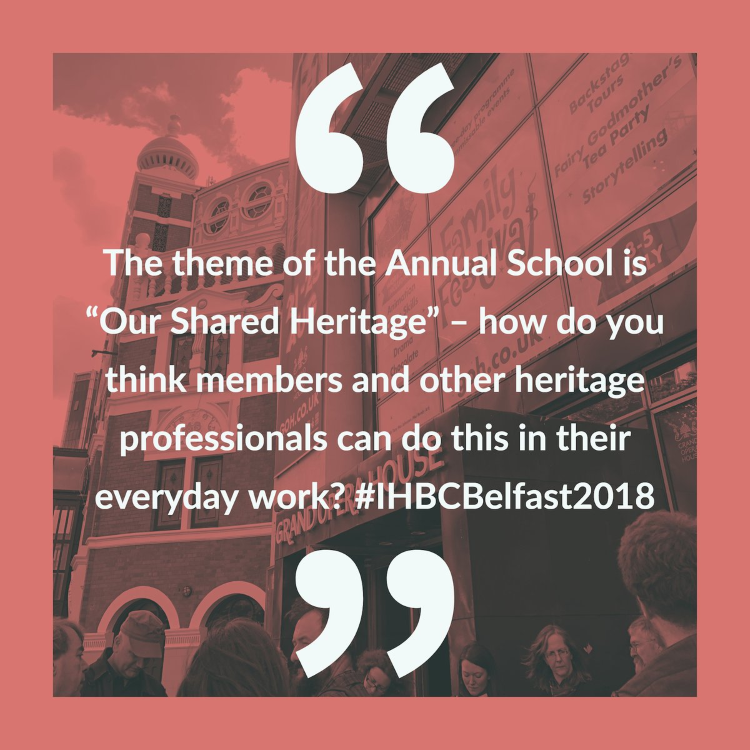 Alison McCandlish said: ‘Thank you again to everyone who took part in the IHBC Annual School in Belfast, and helped to ‘share our heritage’ through digital storytelling. If you were at the School you may have noticed that one of our speakers was filming and recording between sessions, and also managing the social media for the School. IHBC HESPR member and Day School speaker, Alison McCandlish supported our internal team as a lead consultant in the area – working alongside our volunteers and membership network – to help offer those not able to attend the best, alternative and shared access to IHBC Belfast 2018. Alison monitored the digital output of the school, helping curate and create content on @IHBCtweet and posts on the school hashtag #IHBCBelfast2018, as well as related posts on the #EYCH2018 and #EuropeForCulture which are relevant European campaigns on sharing cultural heritage. Alison recorded a series of YouTube videos at the Belfast School, and a taster promotion for the Nottingham 2019 Annual School. In the spirit of widening access and helping spread the message of the conference all of the YouTube videos have CC subtitles, which helps those who use accessibility tools and also those who watch videos on silent when they are on the move or in the office without headphones! Several volunteers gave interviews at the school reflecting on their experience, and these are available on Soundcloud as a playlist. In each Wakelet you will find a selection of Tweets, Instagram posts and relevant internet links to make it easier for members to follow up on CPD links. As a speaker at the Annual School, Alison gave some tips and hints on using digital storytelling for ‘Sharing our heritage’, with examples from projects which she had been involved with, and has also produced a Wakelet tips page which has suggestions from conference delegates on how we can all try to ‘share our heritage’ more effectively, from engaging seldom heard audiences to helping to promote a project online. Materials from all of the speakers at the Annual School will be shared online.